Ancient Ayurveda teaches us the importance of balance in the body. The Prakriti imbalance will lead to many problems, however here we talk about the imbalance in metabolism which leads to weight gain, unhealthy and unfit body. Anammyaa Wellness Weight Fit Chooranam aims to balance the dosha in a constitution and thereby ensuring the body reaches its optimum levels. Anammyaa Wellness Weight Fit Chooranam is a mix of powerful ancient herbs that effectively and efficiently, without harming the system, brings the balance back to the body thereby leading to higher metabolism rate which burns fat faster. It contains Haritaki (Terminalia chebula) the mother of all herbs has got anti-inflammatory, analgesic, anti-ulcerogenic, antioxidant, anti-bacterial, anti-fungal, anti-carcinogenic, anti-viral, astringent, anti-aging, anti-arthritic, anti-microbial, hypoglycemic, anti-pyretic and hypolipidemic properties. Pipali (Piper Longum) kindles the digestive power to assimilate more nutrients and scrapes toxic buildup from cell walls, arteries and tissues to reduce excess body weight. Kaalijeera (Black Cumin Seeds) is efficacious to speed up metabolism and burn calories. It is Kaphavatashamaka – balances Kapha & Vata and increases Pita. Saunf (Fennel Seeds) consists of flavonoids and used to counter flatulence & bloating. Ajwan (Carom Seeds) a powerful cleanser which helps alleviate gas and discomfort in stomach.Green tea is loaded with antioxidants & bioactive substances like caffeine and EGCG. Belly Fat, Hip Fat, overall high weight, sluggishness, acidity, heartburn, high cholesterol and breathing problems. 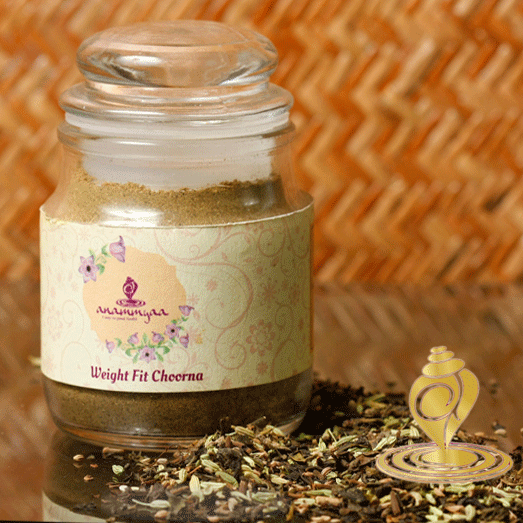 Weight Fit Chooranam increases metabolic rate and burns fat faster than any other remedies. However, it is more suitable for people with fatty liver, high cholesterol, breathing trouble due to excess KAPHA and KAPHA Prakriti. Weight Fit Chooranam is found to be effective for reducing belly fat and hip fat. It speeds up fat burning by increasing metabolic rate and rectifying the fat metabolism in the body.